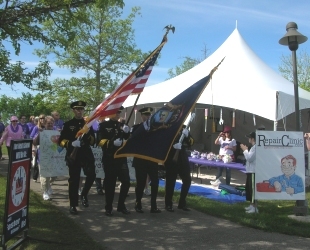 Last weekend, RepairClinic.com participated in the Relay for Life fundraiser in Canton, Michigan. This is an inspiring event that celebrates the lives of people who have battled cancer, remembers loved ones lost, and fights back against the disease by raising money for research. All the money is donated to the American Cancer Society. At the Canton Relay, teams of people camp out at our local park and take turns walking or running around a path surrounding a small pond. This is the second year that RepairClinic has participated in this event and we all find it very moving and inspiring. The event starts with the survivor’s walk. Participants stand on the sidelines and cheer those who have battled the disease. I always cry when I look around me and see young children, mothers with babies, middle aged people, senior citizens. No one is immune to this disease. Still, as hard as it is, there is healing and comfort in the support and cheers from other people, in their love and encouragement. The Relay For Life of Canton celebrated 347 survivors, had 1,283 participants, honored the battle of over 3,630 loved ones with luminaria and raised $248,062 for the fight against cancer! We exceeded the community’s fund-raising goal by $8,062! RepairClinic thanks all of you for your help. Happy birthday, dear friend! Love and hugs. I attended a Relay for Life in Seattle and it is true what Dave above says. Also, I used to think it was ‘corny’ for people to applaud the marchers, but having been a marcher, I was surprised at how touched I was at their applause. I find this not only an important event but a fun event as well. You don’t realize how many other people have been affected by this terrible disease till you attend one of these functions. GOD BLESS ALL THE SUVIVER”S AND THEIR SUPPORTERS.